In the event you can't see the sign, it reads "COLON CURVES". 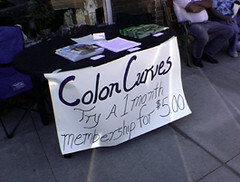 Yep, Curves for Women has a fitness center in the town of Colon, Michigan. I'm at a loss for words... make up your own.